Bloggers, do any of these sound familiar? Have you been blogging for a while, but feel like your site isn’t making money even though you work hard at it? Have you tried adding affiliate links and/or ads, but feel like you still aren’t making enough to make it worth your time? Do you have quality content, but feel like you aren’t getting the same offers that other bloggers who create similar content do? In the Online Monetization Strategies Course, I will teach you ways to monetize your blog, your social media platform, and your newsletter. We will also explore ways to make money that move beyond your blog. 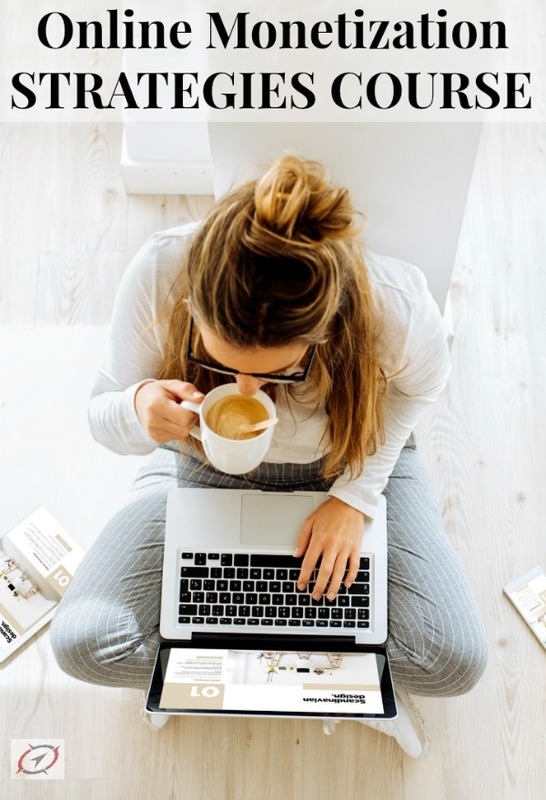 I will share a variety of ways to monetize your platform so you can immediately begin to personalize the strategies for your blog and audience. I know exactly how you feel because I’ve been there! I originally created my blog, Premeditated Leftovers, as an extension of my volunteer work as a budget counselor. When my husband was forced to take a 20 percent pay cut, I decided to transform my site from a part-time hobby blog into a full-time business. I discovered that working harder and longer without changing my strategies did not result in an increase in more income. It turns out the reason my blog was stagnant wasn’t from lack of my efforts. It was because I wasn’t monetizing my efforts effectively. Now instead of working harder, putting in more hours, I make the strategies work for me. Now instead of working harder, I make the strategies work for me. To increase your affiliate income you need to carefully choose the type of affiliate program, how your wording frames the affiliate link, and the link placement. If you want to increase your ad revenue, you need to strategically select the types of ads, as well as your placement. There are many ways to work with brands beyond sponsored posts. You can monetize your newsletters and social media accounts while providing something of value to your subscribers and followers. I built my blog into a 6 figure full-time business, and you can too! You don’t have to struggle like I did! I’ve now spent three years successfully teaching other bloggers how to increase traffic and revenue, so I know these strategies work on sites other than my own. The techniques I use can be implemented in a wide range of blogging niches. Will you have the same level of success? I can’t make any promises, but I will openly share my techniques with you in video tutorials. I also provide weekly HotSeats to strategize monetization methods as well as Q&A sessions to help you adapt my strategies to your niche and employ my approach on your blog and social media accounts. 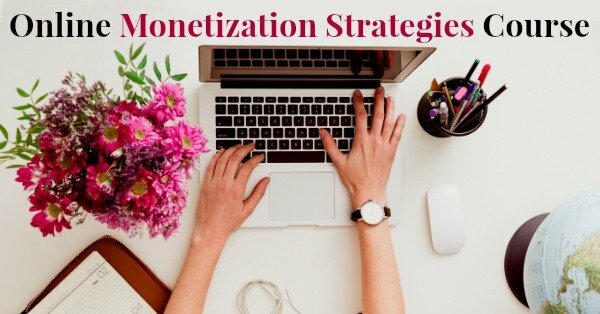 The Online Monetization Strategies Course is designed to help established bloggers implement blogging, social media, and newsletter strategies to monetize their platform and diversify their income streams. 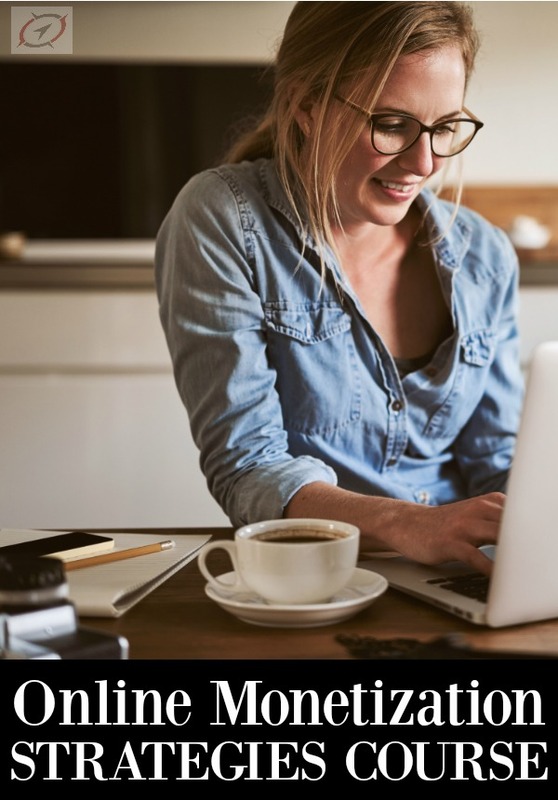 The goal of the course is to help bloggers make enough money to work from home and make a meaningful contribution to their household income. Tailor the Strategies to your strengths and assets! We will start by identifying your best platform for increasing your income. Then we will look for untapped resources to diversify your income streams. I am including 2 one-on-ones with me in the beta version of the course. The first meeting will be used to identify the areas you should focus on first to increase your revenue and help you get off to a running start. The second meeting will be used to create a roadmap for your future monetization plans. Who is the Online Monetization Strategies Course is designed for? The Online Monetization Strategies Course is designed for established bloggers who have either reached a plateau or are trying to figure out how to break through to the next level in blog income. 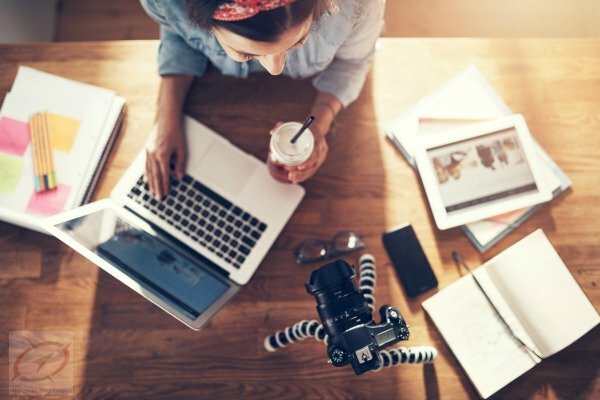 This course helps traditional bloggers, micro-niche bloggers, and online influencers monetize their entire platform. 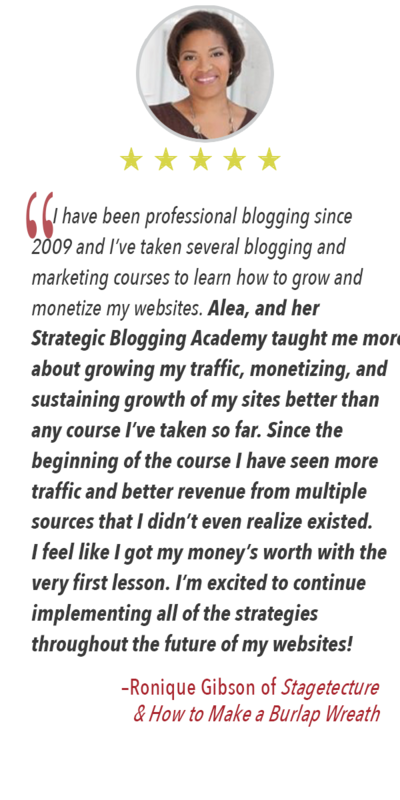 The Online Monetization Strategies Course is not a beginner’s “how to start a blog” course. What will we do in this course? First, I’ll tell you what we won’t do: We will not start this course by looking at your site design. Why? Because redesigning a site is a great way to procrastinate. It’s a stumbling block that prevents forward movement. Instead, I will start by giving you blogging tips and monetization tips that you can apply to the very next post that you write. Each module will include 4 – 6 lessons, instructional videos, and printable strategy planning worksheets. We will have a weekly online meeting to discuss the material, provide additional insight, do hot seats, brainstorm, and answer questions. In our exclusive Facebook group, we will discuss concepts, share wins, and address questions throughout the week. There will not be any busy work! Your assignments will be implementing what you learn on your blog, social media, and newsletter. This beta course will open on March 12th. Each Monday a new module will be available to you. We will also have a weekly online meeting, where we will discuss strategies for implementing the concepts for your niche. This will be followed by a Q&A. The course will begin the week of Monday, March 12th. The Beta version of the Online Monetization Course is $199. You can pay with a credit card or PayPal. How long do I have to buy the Course? This course will only be available to purchase through Friday, March 16th. After that day, I will close the cart. Topics covered in each weekly module are described below. Keywords lay the foundation for being found on search engines, social media, and for being discovered by brands, so we will begin by covering the types of keywords, how to find keywords, how to choose keyword phrases, how to optimize a post for more than one keyword phrase, how keywords can positively impact ad income even when you aren’t on page one of the search results page, and how to use keyword phrases in social shares. In module 2 we cover how to find higher paying affiliate programs, incorporate affiliate links into a post, where to place affiliate links to increase click-through rates, how to use affiliate links on social media, how to use direct market products and CPA as affiliate links, and how you can use affiliate links in newsletters. In module 3, we cover ways to partner with brands including underwritten posts and newsletters, creating sponsored posts that your readers will enjoy, how to set prices for sponsored work, and best practices. We will also cover ways to monetize your social media channels, types of sponsored content available to bloggers on social media channels, where to find social media work, and best practices for paid work on social media. In module 4, we cover the different types of ads, why the type of ad is important, where to place ads, how to create passback ad tags, how to set up waterfalls, how to turn off ads, which types of ads you should avoid, how to find ad networks, and how to create passive ad income without annoying your readers. In module 5 we cover product creation including writing an e-Book, writing a “real” book, creating a course, and other product ideas. We will cover selling your own product, the technical aspects of selling these items, and time management tips to help you find time to create your product. In module 6 we cover business ideas that move beyond your blog and even your platform. Explore services that you may be able to provide to brands, local businesses, or even other bloggers. 2 thirty minute One-on-One Brainstorming Sessions with Alea to help you tailor the strategies in the course to your gifts and blogging assets. Although the beta course is on sale for $199.00, you will receive lifetime access to the Online Monetization Strategies Course and the Bonus Material. If you experience any problems purchasing this course, please email me at [email protected] and I will help you resolve the issue. After purchasing, be sure to check your spam folder for emails from Strategic Blogging Academy and be sure to whitelist us, so you don’t miss out on any of our lessons or meetings. Copyright 2016-2018 Strategic Blogging Academy. All Rights Reserved.